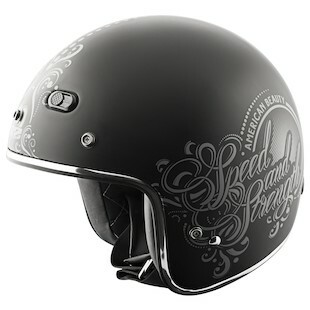 It is hard to deny that Speed & Strength is going after a specific customer base with their SS600 helmets. For years, the vintage-styled three-quarters helmet has been the calling card of a very particular group of riders. Choice of bike is not that important, since these vintage-look bikers can be found on anything from custom cruisers to ratted-out cafe bikes. Speed & Strength has long been catering to this demographic with their SS600 helmet, and now they have come out with four new graphics. 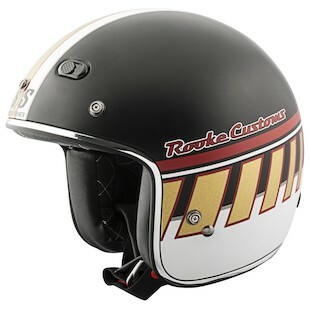 First up is something for the rider on a custom cruiser, chopper, or show queen: the new Speed & Strength SS600 Rooke 2 Stroke Helmet. Bike fabricator Jesse Rooke has been in the limelight since 2002 and has made a name for himself by standing out from the sea of cookie-cutter customs. His designs may be polarizing, but they are intended to showcase something new and different. In partnering with Speed & Strength, they have created a 70s-style Black, Red, and Gold helmet with a matte finish. Between snow-capped Rocky Mountains, golden Pacific Coasts, northeastern forests and shore lines, and amber fields of grain, there sure is a lot of natural beauty in the US. I wonder if this was the inspiration behind naming one SS600 graphic the American Beauty? Maybe the team responsible for naming products is a fan of Kevin Spacey and Annette Bening. Regardless of where the name draws its inspiration from, this graphic aimed towards female riders is refreshingly simple. The Speed & Strength SS600 American Beauty has a restrained design on the front of the helmet, some branding on each side, and best off all Speed & Strength has resisted the urge to paint it hot pink. Next up is the Restomod graphic, which would be a good match for any bike that is not *quite* finished yet, or is gaining a vintage patina. The graphic design is a simple White and Gold stripe on a Matte Black base color. The helmet is made to look distressed with the addition of silver “scratches” that are painted over the entire helmet. 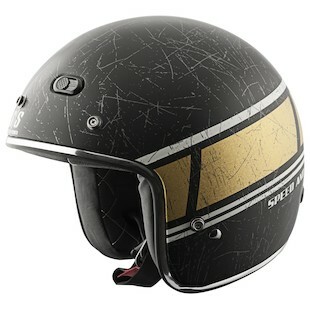 A Speed & Strength SS600 Restomod helmet for your restomod project; now that is a great pairing. 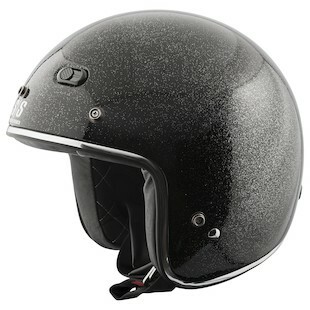 Last but not least is the most subdued new graphic for the SS600 line: the Speed Metal. This graphic is a metal flake paint finish available in Gold, Orange, Red, and Black. There are no changes to the Speed & Strength SS600 Speed Metal helmet, which still uses a Thermo-Plastic Alloy shell, a quilted inner liner, has two brow and exhaust vents, and has five snaps for attaching shields and visors. Sometimes looking the part is just as important as playing the part. For 2014, Speed & Strength have refreshed their SS600 helmet line so it is now easier than ever to pull off that vintage-style look.